Zmodo EZCam offers you the easiest way to check in on home while you’re away. With motion detection alerts, on demand remote viewing, two-way audio, and night vision, the EZCam is the easy and simple way to protect your home. No installation. Set up in seconds. Not only is EZCam the smartest home security solution, it’s also the simplest. Just set EZCam where you want to, plug it in, and enter your WiFi information using the iPhone or Android app. Motion and sound activated cameras and activity alerts provide real-time Zmodo app notifications while away, customize motion area to avoid frequency alerts. All Zmodo devices can be added to one Zmodo account, share access using the free Zmodo app to help keep everyone connected. Zmodo apps and EZCam connect to the Zmodo servers using bank-level AES 256-bit encryption and Transport Layer Security (TLS). All video and pictures are secured with AES 256-bit symmetric-key encryption. 720P HD VIDEO CAMERA: The wifi home camera provides 115°wide angle with 4x digital zoom function to produce bright and crisp images.720p HD Camera gives you clear images day or night. The wireless camera works with Alexa for voice control (Alexa device sold separately). TWO-WAY AUDIO & NIGHT VISION: Zmodo Home Camera provides high quality integrated microphone and speaker to reduce background noise and improve audio output. A built-in anti-noise filter microphone allows you to enjoy the talks with families and pets wherever you are. Adjustable night vision sensitivity allows you to control the automatic infrared night vision, which can see up to 26ft in the dark. MOTION ALERTS: With built-in high accuracy activity detection technology, wireless security camera sends instant alerts to your mobile phone. Home Camera receives an alert and a short video clip whenever motion is detected. CLOUD RECORDING: 24/7 continuous recording on cloud, and you can customize, share, make video clip and flashback or download footage at any time. Motion clip alerts are saved on cloud for 36 hours for free. Get one month free trial when you subscribe to Zmodo Cloud, which boosts your device's intelligence level, such as reducing false alerts. 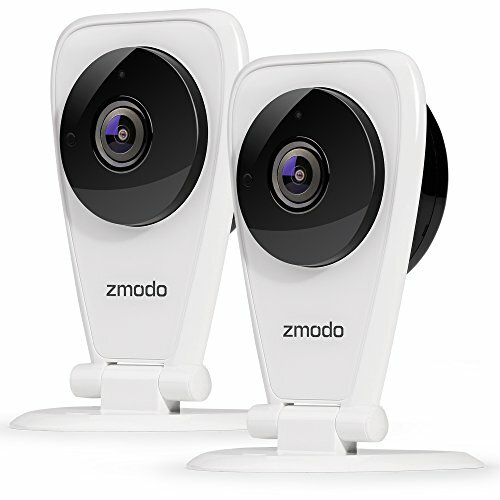 REQUIREMENTS AND WARRANTY: Zmodo EZcam requires a password-protected 2.4GHz Wi-Fi connection with WPA/WPA2 encryption, not compatible with 5.0GHz Wi-Fi. Product includes 2x 720p HD WiFi Camera, 2x 6ft power adapter and 1x quick guide. Besides, we provide a full 3-year US warranty, 60 day return policy, and lifetime U.S.-based tech support.